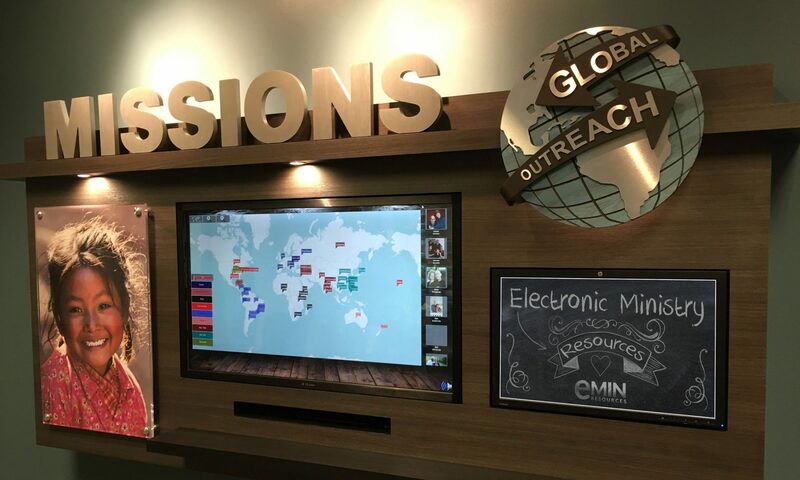 Welcome to Electronic Ministry (eMin) Resources – your one stop for Mission Display, Church Website, Church Kiosks for Online and Kiosk Giving with GiveSafe, and much more. You’re looking to modernize your church with state-of-the-art technology without overwhelming your members. eMin Resources has the answers to your technology questions. All of our products have been built with the church member in mind. Ease of use, functionality, and security are the building blocks of these powerful products. You have discovered one of the most modern and powerful tools available to connect your membership and visitors with all of your missionaries. At the touch of the screen users will have quick access to your missionaries. Prayer letters, video, prayer card, phone, location, and more. You can even email your missionary directly from the touchscreen! eMin Resources is your one stop for professional Mission Display, WordPress Church Websites, Online Giving with GiveSafe, and much more. If you are looking to modernize your church without overwhelming your members, look no further! We make online giving easy and secure! Donors can give one time or setup recurring gifts. Accept cards and eCheck gifts! With GiveSafe online and mobile giving donors can give anywhere! Adding a GiveSafe kiosk will allow donors to give inside your church or organization. Allow supporters and members to easily register and pay for events online! Create as many events as you wish! Want to raise funds for a new project? The GiveSafe fundraiser feature allows you to create an unlimited number of fundraisers each with it’s own web page! The GiveSafe shopping cart makes offering CDs, videos, books, shirts or whatever your organization offers a snap! Electronic Ministry Resources makes online giving easy for all Churches and offers the ability to accept all major payment cards and ACH transactions quickly and affordably. We do not charge an additional fee to have more than one GiveSafe giving kiosk! Pay one low monthly fee and put the giving application on as many kiosks you wish! If using a separate PC – How will you conceal the tower? If using on a counter or tabletop – Does the monitor move easily when touched? Does the bezel have a flat surface to mount card reader? This Small form factor PC is perfect for attaching a large touchscreen. Measuring less than 2″ thick makes this PC easy to conceal. The eMin Resources Mini PC is well built, using only top name brand components. So if you plan on putting the eMin Missions Application on a large touchscreen or already have a touchscreen monitor the eMin Mini PC is a great buy! The Podium Kiosk now offers an economical and portable kiosk without sacrificing functionality! Detail: This secure card reader is built for reliability, and installation ease. This unit is designed to seamlessly attach to your kiosk. Detail: The Epson T20 is a very reliable and easy to use thermal printer. This unit connects to your kiosk through a USB connection. The eMin Resources Missionary Display System is a revolution in how Church members stay up to date and in touch with your missionaries! Easily display the latest missionary letters, videos, prayer cards and even church announcements easily with the Missionary Display System. Missions Application allows churches to stay in contact with Missionaries at a level never seen before. Specialties: emPower Church Kiosk, Online Giving, Ministry Partners and Missions.